In the same way that your eating habits are extremely telling, the way you shower actually speaks volumes about your personality. Scroll through these exclusive images below to find your shower habit and see what it says about you. 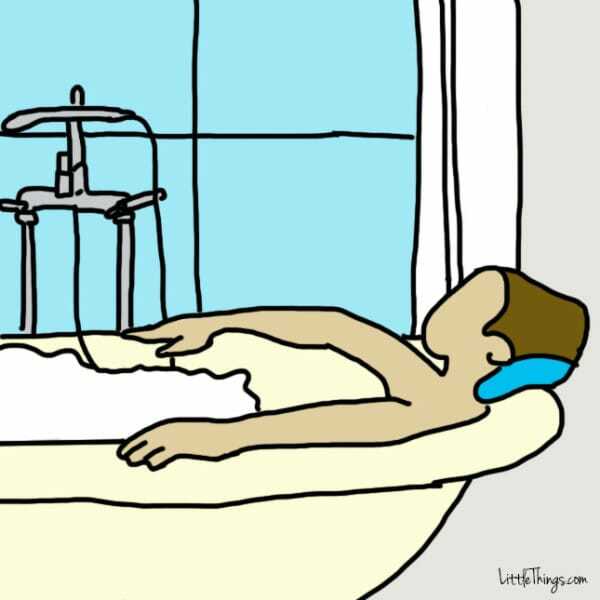 Some people use coffee to wake themselves up in the morning, but I use a nice hot shower. In fact, if I don't have time to shower, you definitely don't want to run into me that day. A morning shower is the perfect way to wake up my brain. I even start to run through to-do lists for the coming day. But it never dawned on me that my shower habits may actually be revealing in more ways than just the literal sense. When I saw what mine revealed about me? I was shocked at how accurate it was! Do you take quickie showers? Do you prefer baths? Do you daydream while you shower? See if your shower habits are as revealing as mine were. 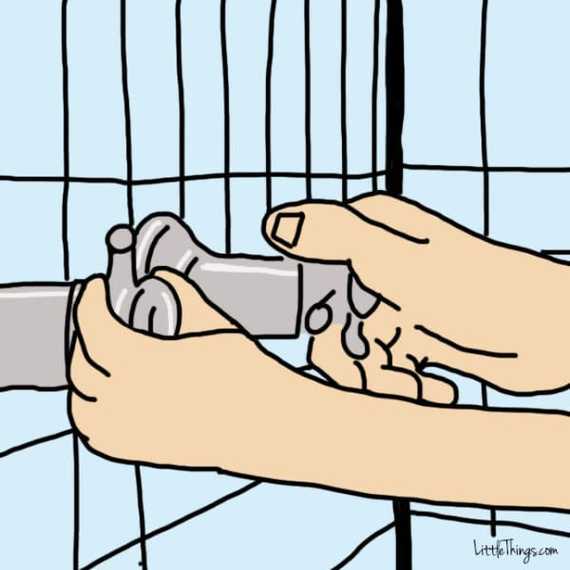 What kind of shower habit do you most relate to? Let us know in the comments. 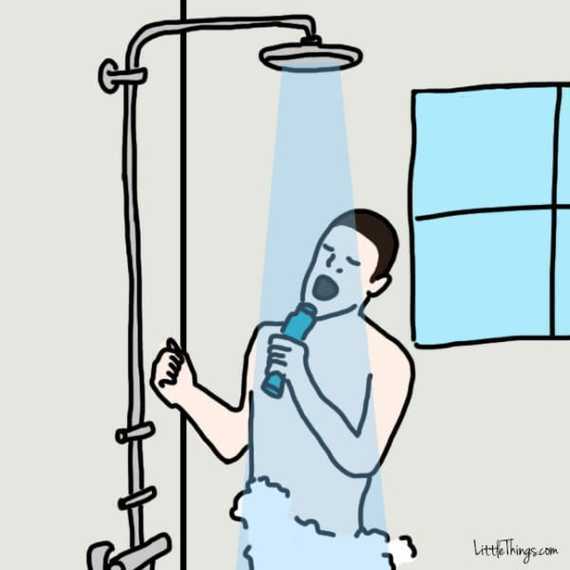 As a person who likes to sing in the shower, you may or may not have real musical talent. But that doesn't matter to you. As someone who wants to always have fun, you don't mind loudly sharing your vocal stylings with the world. You are a confident individual who doesn't overly worry about what other people think about you. This will help you to go far in life, as you won't get hung up on feeling self-conscious or embarrassed. And as a person who likes to cut loose, friends and family absolutely love being around you! As a person who likes to brush in the shower, you are taking full advantage of your multi-tasking brain. Why waste time brushing your teeth at the sink after your shower when you could kill two birds with one stone? You like to make the most out of every moment in life, so you never want one to go to waste. As a result, you are sometimes impatient, but people admire you for the way you are able to conserve time, money, and energy. You are an overachiever with a friendly sense of competition, which will take you very far in your career and in life! As a person who loves taking long, luxurious baths, you are showing the world that there is just no need to be stressed out. Even when you're in times of stress or drama, you know that you'd much prefer letting things go and enjoying life's simple pleasures instead. You are a pleasure-oriented person with a very strong sensual side. Mentally, you prefer a relaxed and laid-back approach. This can make others jealous, as they envy your calm, cool, and collected nature. Whether or not you are in good physical shape is irrelevant, because you are very in-tune and connected with every inch of your body! As a person who likes to make lists in the shower, you are someone who finds it very hard to turn your brain off. Even at a time when all you have to do is wash your hair, you can't help but make to-do lists for the upcoming day. But that isn't necessarily a bad thing. You are right at home up in your brain. In fact, shower time is where you often do your best thinking. You love working out problems and organizing things mentally for the future. This list-making shower time helps you to be prepared when it comes to work and relationships! As a person who likes to take quickie showers, you probably aren't the most on-time person out there. Whether you take a fast shower before work or a quick one before going out in the evening, you probably haven't left yourself enough time to get done everything that you need to. But that's not something to worry about. Just because you are running late for appointments doesn't mean you aren't on top of things. You just have better things to concern yourself with, like family and friends. You are a caring person who will often put the needs of others before mundane work. But your relationships will be all the better for it! As a person who likes to take ice cold showers, you do not enjoy the feeling of being overly worked up. You are often easily excitable even though you don't necessarily enjoy the feeling of your blood pressure rising. Luckily, cold showers are there to do the trick. As a person who gets worked up quickly, you may find yourself in the middle of arguments or disagreements more than you would like. However, you have an astute self-awareness that allows you to recognize when you need to seek a calming alternative. This ability certainly comes in handy when you find yourself getting carried away with things! 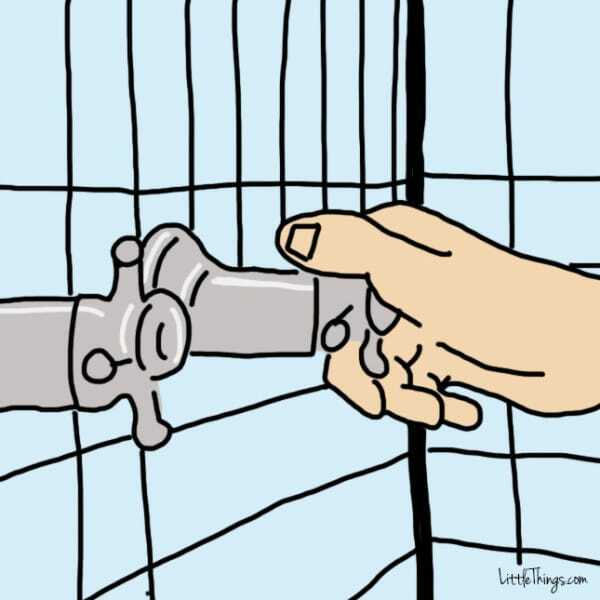 As a person who likes to daydream in the shower, you could very easily let the entire day slip away from you while your imagination takes you on flights of fancy. The shower is the perfect calming place for you to let your imagination run wild. You are a person who dreams big and hopes to go many places in life. You have a creative mind that helps you at work and in your everyday life. You enjoy artistic endeavors and are something of a free spirit. Others admire your unique sense of humor and your ability to see the world in a creative way! As a person who likes to shower with a loofa, you take a very thorough approach to your showering ritual. This thoroughness carries through into the rest of your everyday life as well. Co-workers and friends find that you are one of the most dependable and reliable people they know. Just like you depend on your loofa, they know they can count on you to get a job done, and get it done well. With a detail-oriented mind, you will go far in your career and in all of life's endeavors! As a person who gets in the shower before turning on the water, you run the risk of getting a burst of unexpected hot or cold water. But this doesn't worry you. In fact, this very much excites you. You have an adventurous spirit, and you approach life just as you approach your showers: with a willingness to live on the edge. You are the biggest thrill-seeker of your friends, and your spontaneous nature makes you someone that they love being around. You take big risks, which often pays off dividends in your career and your relationships! The way you approach your shower can certainly reveal a ton about your personality. 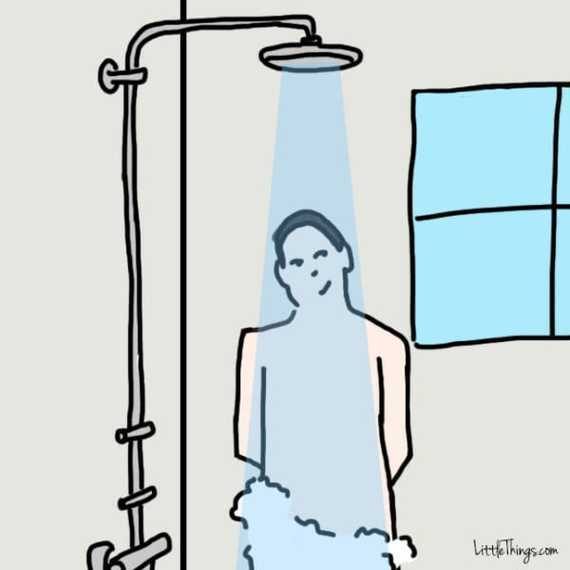 What did your shower habit say about you? Let us know in the comments! Please SHARE to see what the shower habits of your friends and family reveal about them.